Everyday classroom dice. 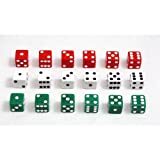 Six each of red, white, and green 5/8 molded dot dice. Hundreds of counting, sorting and math applications. Set of 18.